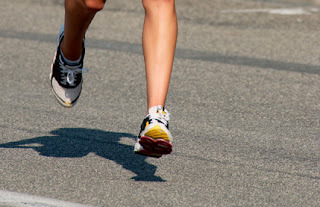 Is Running with Your Feet Pointed Forward Good Advice? While reading an article on the suggested form for runners, I came across a suggestion that may not be the best advice for every runner. The advice provided suggested that runners should concentrate on landing on their foot with the toes pointed forward. Just as when patients have told me that they were advised to try and alter their walk, my response is that it depends on what your body alignment. In most cases, I would not say to try and alter the way your foot lands with walking or running. Both walking and running should have a natural stride because feet have a natural angle and base of gait. This angle and base of gait is usually asymmetrical with most people. Being asymmetrical, your natural angle and base of gait should be preserved with your activity such as walking and running, unless you are trying for short distances of speed. Why? Because when you alter the natural angle and base of gait, you force muscles to operate asymmetrically. This can then lead to asymmetrical body function, which leads to added stress, strain, and compression to muscles, tendons, ligaments and joints. How? The angle of gait is the angle formed from the longitudinal bisection of your foot from an imaginary straight line on the ground forward bisecting the middle of your body. The base of gait is the width of your feet with a relaxed stance. When we are born, these change dramatically from birth to adult. Look at a child; they are usually bowlegged with their hips external and a wide base of gait. As we grow from an infant to an adult, our hips will rotate significantly inward yet our femur will externally, torsional rotate. This typically results in aligning our knees forward as an adult. Regarding our legs, the fibula malleolai (the outer or lateral ankle bone) will rotate externally about the tibia. This leaves our feet, on average as an adult, to be abducted or angling out about 22 degrees. This is our average adult angle of gait. Furthermore, bones in our feet will also rotate and torque such as our talus and metatarsla. The foot bones lack of or over torsional positioning of can lead to things as a bunions, rigidus, sesmoiditis, and metatarsalgia and metarsus adductus. Typically, one side of our body does not equally develop through these rotations and torsions. Therefore, if you try to plant your feet straight forward, then you are asymmetrically positioning one side of your body which will apply increased strain on certain muscles, ligaments and joints on that side. Some studies show that we are a human machine similar to an automobile, like a walking robot. As a moving robot or machine, all of our parts must be equally turning, twisting, and torqueing at exactly the right moment of time during our movement. If one part is overworking in an attempt to keep symmetry, then that part will eventually break down producing an “overuse injury.” Attempting to force your feet to equally land straight will most likely cause a portions of your anatomy to become overworked, overstressed or strained. This certainly can lead to injury and pain. I believe altering your gait may sometimes enhance your performance in certain activities, however, repeatedly doing so, especially with an uneven body development like most have, may lead to pain and injury. Learn your body mechanics by calling ArchMasters today to receive a complimentary consultation with Brentwood Podiatrist and Biomechanical expert Dr. David Sables. ArchMasters- Nashville’s only shoe store with a Doc in every shoebox! Should You Try Minimalist Running Shoes? Biomechanics – Keep Your Feet Moving On!